We arrived in Cartagena fearing the rain (the weather forecast predicted thunderstorm for every single day of our say). We quickly felt silly because every day we would be greeted with a blazing sun, cloudless sky, and temperatures in the high 80’s. Cartagena is a town made for wandering around and except for a half a day visit to El Vulcan del Totumo, that’s pretty much what we did. But only after 4 pm – before that we were too busy hiding from the sun sipping fruit juices on our hostel’s terrace. 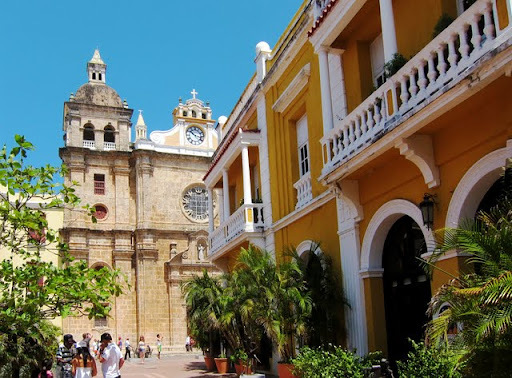 We knew that the old city of Cartagena is divided into three* districts: Getsemani, El Centro, and San Diego, but did not realize how different in characteristics they are. *Note: Actually four. But Matuna is so small and modern it is of little interests to regular visitors. 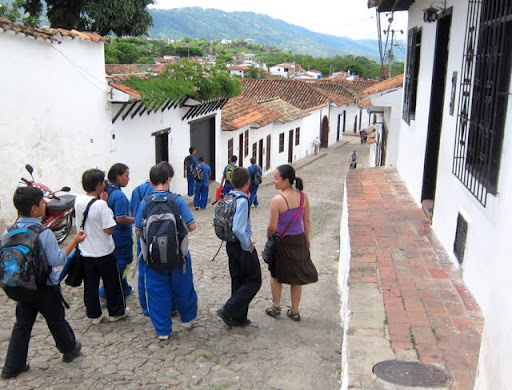 Getsemani was filled with backpackers due to the concentration of budget hostels in the area – especially since we stayed there during Semana Santa, a holiday week for many of the locals. 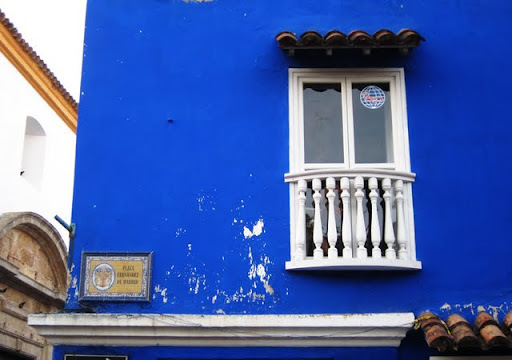 We stayed in cozy and friendly Hostel Marlin on the main street of Getsemani that faces the busiest street in this part of town, Calle de La Media Luna. The street was very active at night and a mix of sound of people, traffic, and music quickly became part of our daily evening work time on the hostel’s terrace. 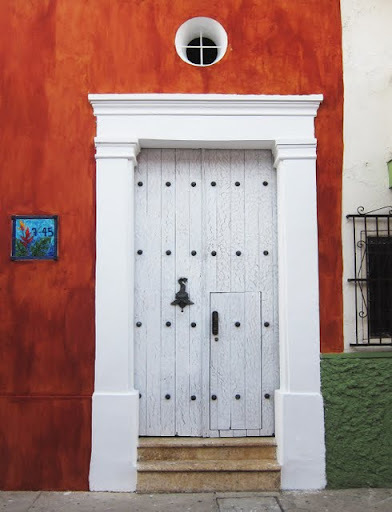 I must admit that Getsemani is a little rough around the edges and we were often on the cautious side of things at times, but I found it charming in its own way. We have taken many walks around and gotten to know some of the residents. Compared to the beauty and the richness that the El Centro offers, Getsemani feels gritty and real. Not to mention this is also where the cheapest food can be found inside the old city. We called this area home during our stay here in Cartagena. We talked about moving to a different neighborhood, but we never did. The place just grew on you. El Centro is where all the tourist attractions are: Plaza de Bolivar, the museums, and the most charming and colorful buildings. 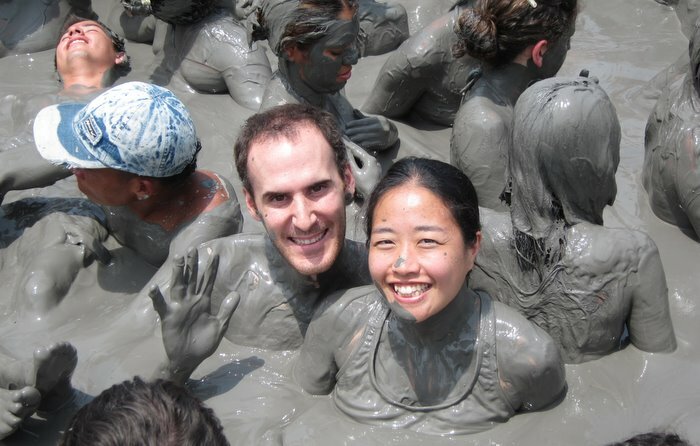 But it’s also where most of the tour companies take their tourists to – busloads of them – and with the tourists come the aggressive street vendors selling antyhing from paintings to emeralds to watches to anything in between. 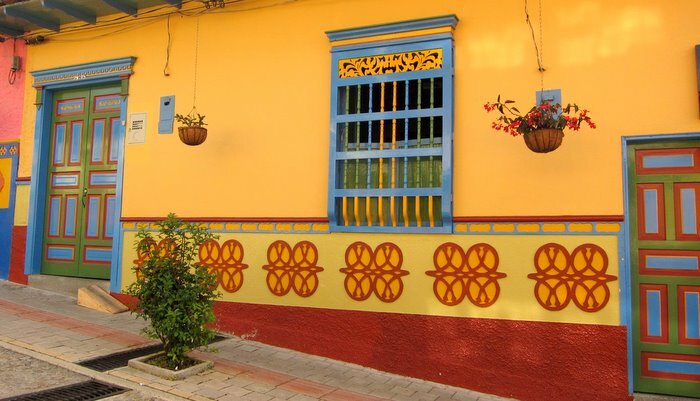 It’s not without its charms though – some of the most photogenic buildings in Cartagena can be found in this area. A fruit seller in El Centro wearing traditional Caribbean dress - don't take pictures of them without buying or tipping. Through meandering around we found ourselves in Fernandez Plaza in San Diego part of the old town. And we were instantly charmed. A Colombian lady we met described the area as ‘magico’ – it IS magical. Ironically, this is the area where we took the least number of pictures. We were too busy wandering around enjoying the atmosphere of the place. The magic is hard to describe. There are small, leafy plazas surrounded by outdoor cafes and bars. People were playing chess on the plazas. Neighbors were gossipping on the front steps of the houses. The roads were not as busy and the parks were filled with young families with kids and couples. It felt like a neighborhood should be – a place where neighbors can hang out and get to know each other. 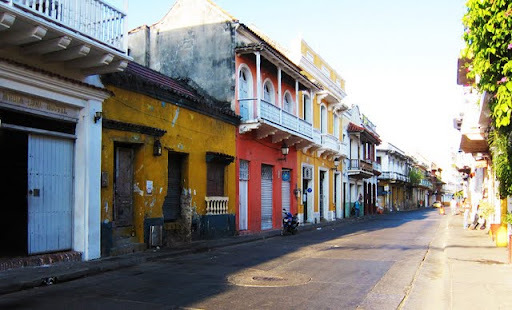 During our many days of wandering around the old city of Cartagena, we were inevitably drawn to this neighborhood and found ourselves at the end of the day sitting in one of the many plazas with a cold drink. 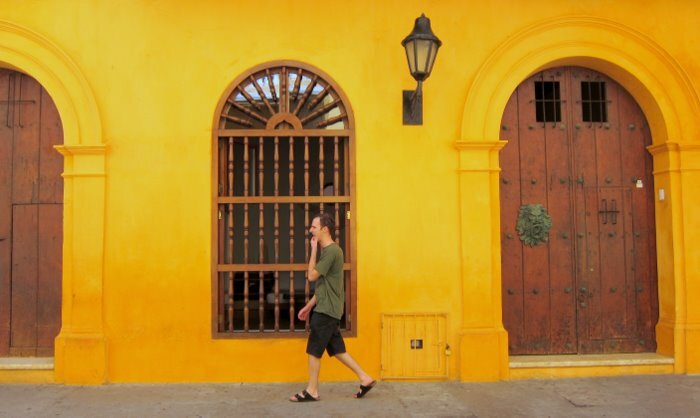 Without a doubt San Diego is our favorite neighborhood in Cartagena. But ssssh, don’t tell anyone. We don’t want the busloads of visitors to swarm this area and turn it into El Centro, do we? I had the same feeling after watching that movie – now I am here. It is a beautiful and interesting city. Reminds me of many European cities. Colorful places have so much more character and you guys did a great job capturing some of best these barrios have to offer. 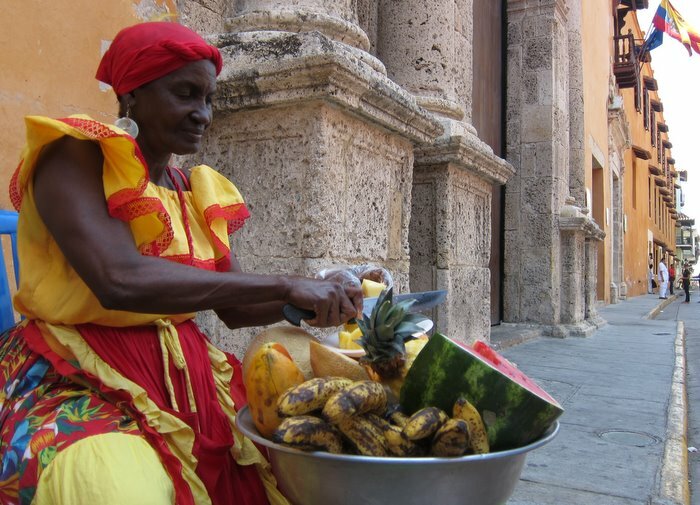 I especially love your photo with the fruit seller in El Centro wearing the traditional Caribbean dress. *Thanks for the advice – Must remember to tip or buy before taking a photo. Will come in handy for me, for sure. Feel free, Michelle. Would love to be of help whenever we can. Love the photos. I had to change my plans and skip Cartagena when I came through Colombia. Posts like this make me want to go back and explore more! Your photos are amazing, really amazing. I was debating on a South American country for a Fall visit but you just made up my mind, Columbia is it. Pretty pictures! How beautiful are the colours?! So many great color, especially love the one from Getsemani. I love, love, love the color in your pictures. Amazing! @Sabrina @Tijmen – Thanks, guys. It was a very colorful city. Lovely post and pictures! I really got a sense of Cartegena and the neighborhoods. Definitely bookmarking this article. 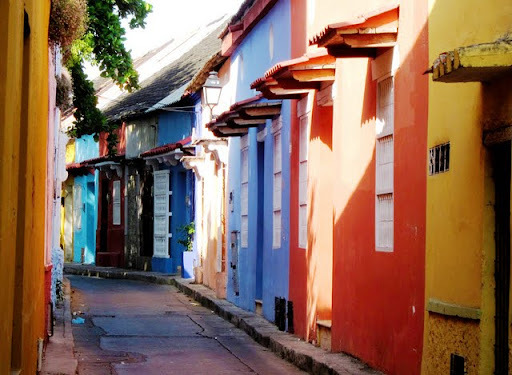 Cartagena is always on my list of must-go places!! When I was dreaming / planning my Cartagena trip (not yet realized), I did discover that Getsemani had the cheapest hotel rates. Definitely – and so many options too. There are some nicer ones as well. The ones off Calle de La Media Luna are quieter. 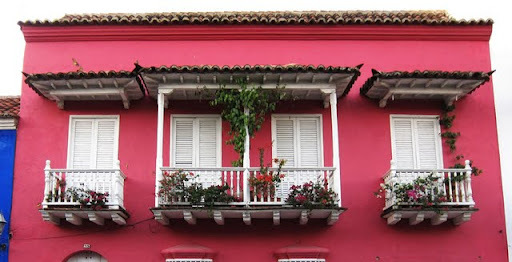 I miss Colombia every day and browsing these beautiful photos of Cartagena transported me back to its warmth and color. It looks like you are having an incredible time — thank you for sharing this part of the adventure with us! oh wow – what great colors! I love it. Columbia must be so captivating in real life. Gorgeous colors! You captured these barrios beautifully. I absolutely love colorful cities and you have captured these neighborhoods so well! Love it! Wow! I have wanted to go to Cartagena ever since watching Romancing the Stone way back in the 80's. I'll never forget Kathleen Turner asking Michael Douglas to come with her to Cartagena, It sounded so romantic. Looking at your photos makes me believe that it is romantic still, even the grittiness of Getsemani. Each district looks awesome. That's funny you mentioned that movie. I saw it for the first time 2 weeks before we left and love it so much. Such a brilliant movie and can't believe I'd never seen it before. And yes, cartagena is definitely still a romantic city. This is amazing! We were just wandering Old San Juan and discussing how amazing the colors are here, but I think Cartegena has SJ beat. Simply gorgeous! 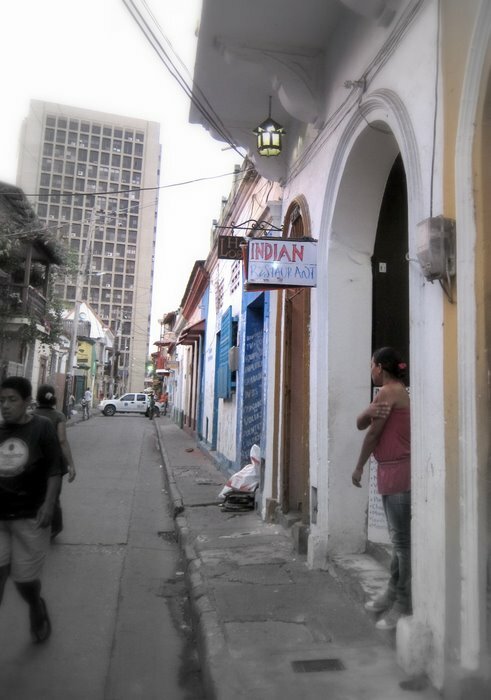 Well done guys, you guys really captured the essence of Cartagena. I reckon it's totally under-rated. Such a lovely city! I love places that embrace the use of color…like San Francisco! San Diego was our favourite area too. We stayed there and loved wandering about the colourful streets. It ALL looks fabulous and utterly charming. Glad you're finding such great places. And btw… "…wearing traditional Caribbean dress – don't take pictures of them without buying or tipping." Seriously. I mean, just THINK of how she has to IRON that blouse ruffle each morning. Surely that alone deserves a tip, yes?